How to demonstrate advisor value and build trust through better communication. For many advisors, developing reports means running numbers. They spend their time pulling data from disparate databases, adding a little bit from the accounting system here or an update from performance returns there. Then they have to format the document just to make it presentable. When advisors are stuck in this manual mindset, reporting is a major drain on time and the end result is not meaningful. At the same time, today’s HNW and UHNW clients are increasingly looking beyond the numbers. They want reports that provide real insight and track against their goals. They want to understand how their advisor’s strategy is affecting their investment performance. They want to know if they’re making the right decisions – about their investments, their strategies and their advisor. more thoughtful, effective and impressive reports that their clients actually want to read. Many advisory firms are investing in reporting systems that streamline report generation. In fact, 45 percent of firms surveyed for the latest CEB (now Gartner Financial Services) Technology Report indicated they will adopt Client Reporting Systems in 2018. A further 38 percent will update the systems they currently have in place in 2018. Leading advisors at these firms now spend less time aggregating data, and more time improving the quality of the finished product. After all, every report is a crucial client touch point. 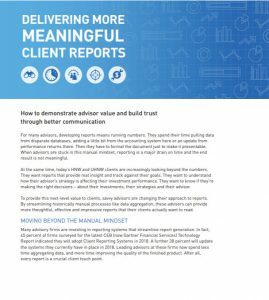 Modern reporting tools allow advisors to compile branded, client-tailored reports that often also include insights and firm-wide updates and information that could apply to multiple clients. What’s more, they can aggregate data from multiple systems and sources – even held-away assets. The most advanced systems can detect gaps in reporting data and import it from systems like CRM or financial planning applications without needing an advisor to manually identify it. require the investor to do anything to get them. They demonstrate to investors that their wealth is in good hands and their advisors are adding value. With that in mind, here’s a closer look at five ways advisors can demonstrate and amplify their value to investors with client reporting.